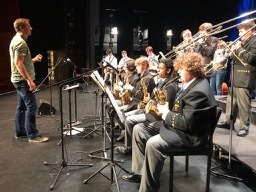 The Big Band participated in the NZ Youth Jazz Competition at the National Jazz Festival in Tauranga last weekend. 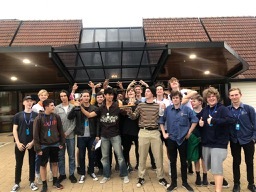 Rongotai had two ensembles in the competition – the Big Band, who performed admirably and was a crowd favourite, playing all four pieces well, with strong solos from Ben Parker, Leonardo Greer, Hamish Goodhue, Connor Waszak, Cameron Young, Darcy Boardman and Ryder Smith. Featured vocalist was Milan Sutich. The other was a smaller group, known as ‘Isn’t It’, made up of five of the talented Big Band men. The weekend wasn’t about the prizes – it was a festival atmosphere – but the efforts of our musicians were acknowledged with two cups and two awards. Thomas J. Moore won the Best Bassist Cup, Rex McKee won the Best Big Band Drummer Cup, the Big Band earned a silver award and ‘Isn’t It’, gold. Coming soon are the Manawatu Jazz Festival Youth Competition during Queen’s Birthday weekend, and the NZSM component of the Wellington International Jazz Festival in early June. The relentless pace for these musicians continues!